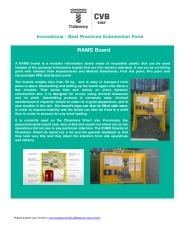 At RAMS Boards we believe that H&S can be presented in attractive way. 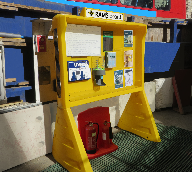 We challenge the status quo by making our information notice boards beautifully design and simple to use. Safety First. Make it attractive and stands out.Can you afford, not to be on Board? 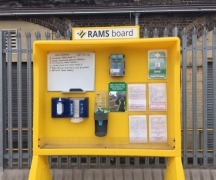 RAMS Boards are modular – three main elements, compact, self-assembly HDPE information notice boards. 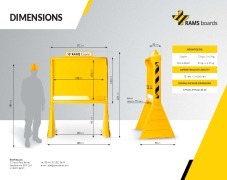 The RAMS Board kit weight is below 50 kg, therefore can be easily transported by two operatives, under current HSE guidance with regards to manual handling. When assembled and fully loaded with water, the board can withstand wind speeds up to 70 km/h (43.5 mph), when anchored it fully complies with "Wind Action" standard EN 1991-1-4:2005. They are made of recycling plastic – they are eco-friendly. Minimum maintenance (clean when dirty) and extremely long durability - makes them very desirable day to day management tool.